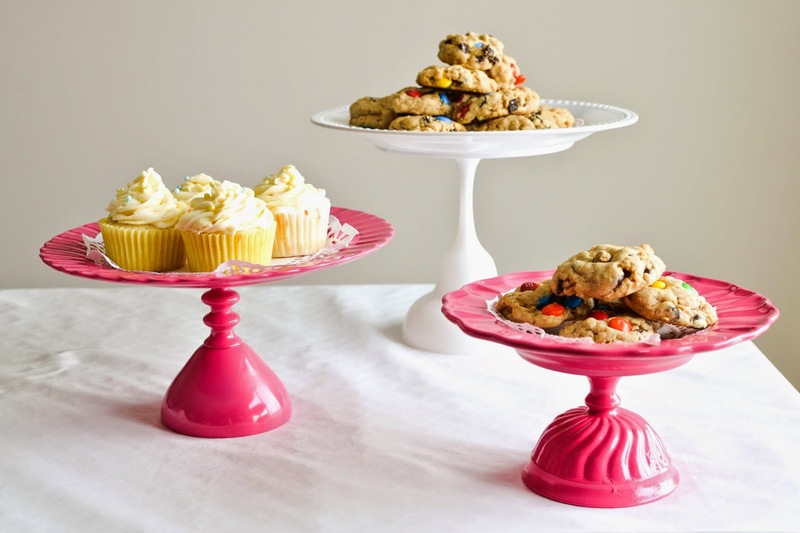 I have a soft spot for cake stands. They have a way of always making my baked goods look better and add a little pizazz to my table decor. However, all of this beauty also comes with a hefty price tag. 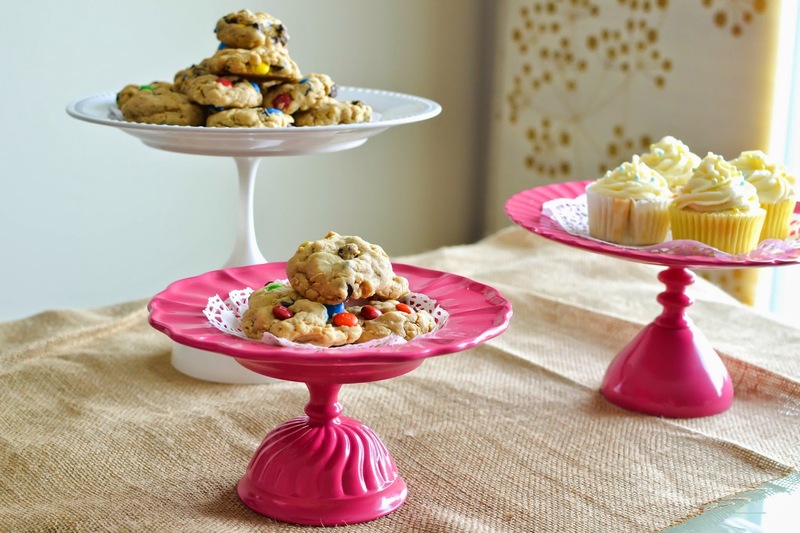 I used to spend a ton money feeding my cake stand addiction until I learned that you can make your own at a fraction of the cost. I spent only $10 making these 4 cake stands. 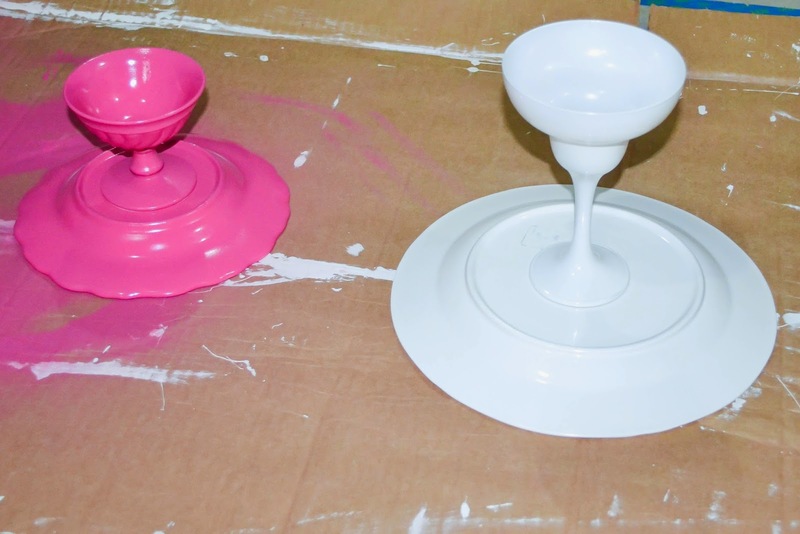 In order to create these awesome cake stands you are going to need some fun plates and stemware. I decided to take my first trip to Goodwill in search of some cheap dishes. Where has this store been all my life? 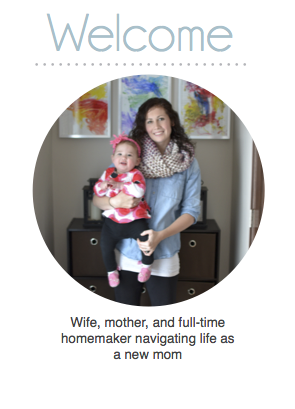 It is a thirty crafter's dream. They had everything from decorations to electronics. It was awesome. Anyway, back to the topic. I found some plates and old stemware for only $1 a piece. I made sure to mix and match plates and glasses and chose differing heights. 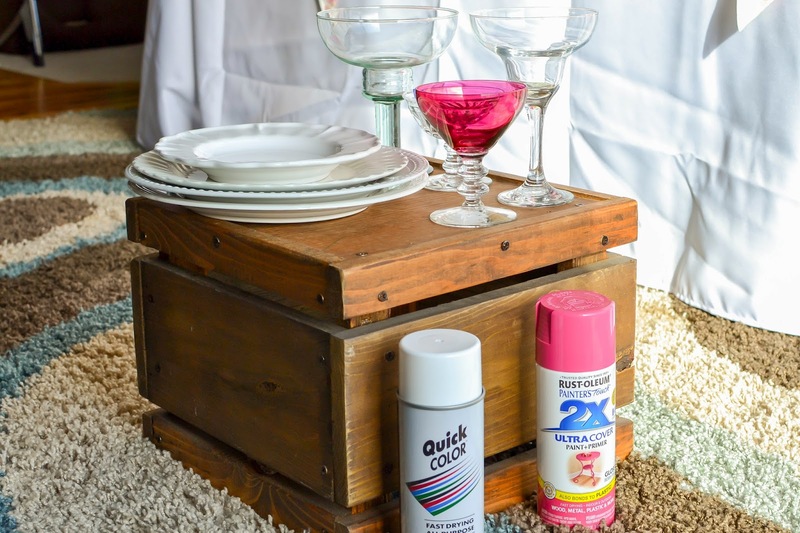 Remove all price tags and wash your new dishes. 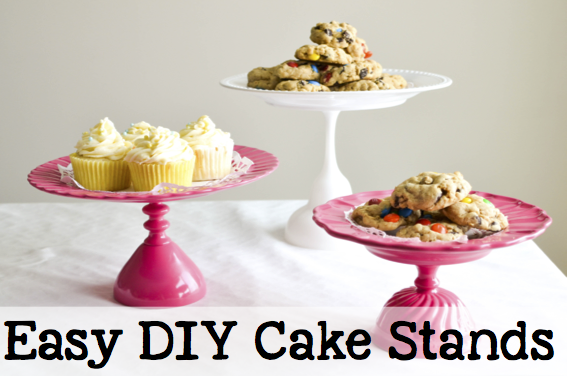 Play with your new dishes and glasses to find out exactly how you want your cakes stands to look. I liked the look of the glasses upside down and it gave my cake stands a nice wide base for support. However, you could see how the stands look with the glass right side up. 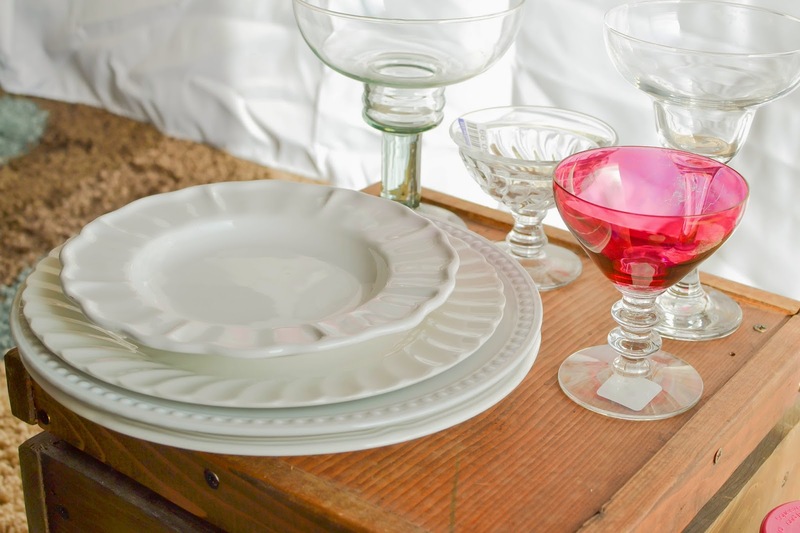 Once you are happy with the look of your cake stand, center your stemware on the plate and give your stand a good coat of paint without bumping the stemware. The silicone will adhere much better on a bare surface. 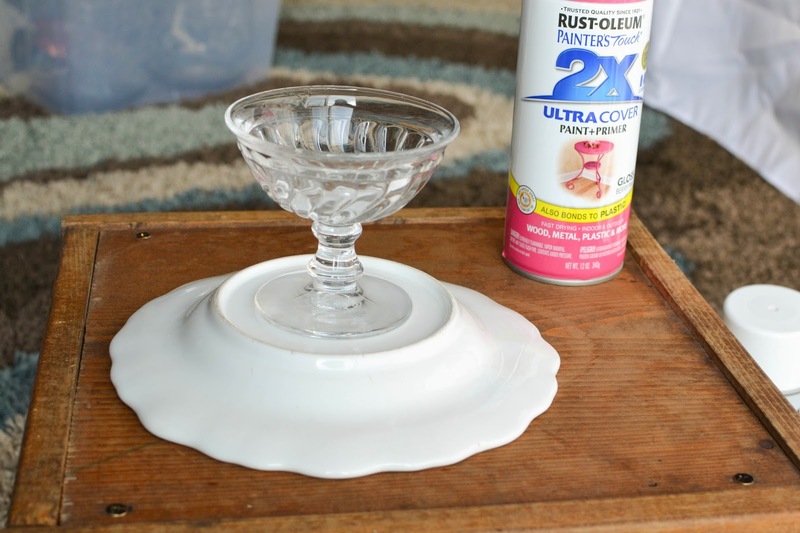 When the paint is completely dry (read your paint can for dry times) it is time to add the sealant. You can find small tubes of silicone sealant at almost any hardware store. I did not have any silicone on hand so I ended up using a huge caulking gun with acrylic sealant. Let me rephrase, my husband used a chalking gun with acrylic sealant. I am not allowed near caulking guns due to an unfortunate incident that ended with caulking on our newly finished hardwood floors. 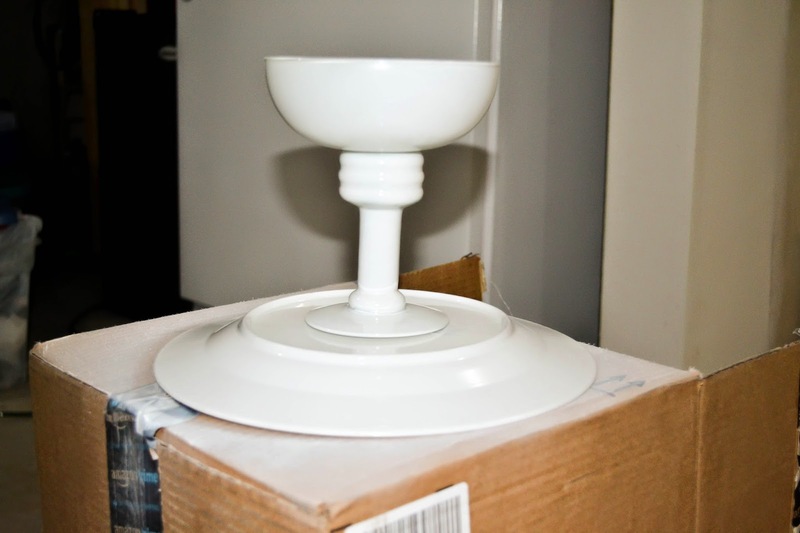 Using the paint line as a guide add a bead of sealant around the base of the plate. Lay the stemware onto the plate and press firmly. If any excess sealant pops out, dab with a wet rag. Then let the sealant dry. This will probably take a couple days. Once the silicone is fully cured you can easily hand wash your stands. Before placing food on the stands be sure to lay down a paper doily. Food and paint don't mix.